Rust remover for metal can save many pieces, but it isn’t a substitute for proper prevention. In this blog series, we’ve covered 10 previous steps you can take to help prevent corrosion on your parts throughout the entire process of production to shipping. In the penultimate installment of the series, we’re looking at a common mistake that we do our best to ensure never happens to our customers — using the wrong VCI packaging products. 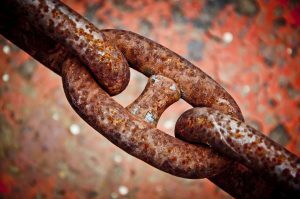 Ferrous metals, non-ferrous metals and multi-metal products can all require different approaches to how rust prevention is formulated. Ferrous– Iron, steel and cast irons. Ferrous metals tend to be useful for their strength and durability leading to their use in a number of weight-bearing applications. Ferrous metals generally have a high carbon content which makes them more susceptible to oxidation than non-ferrous metals. Non-Ferrous– Aluminum, copper, lead, zinc, gold, silver and tin. Non-ferrous metals tend be lighter in weight and more malleable than ferrous metals. Non-ferrous refers to the absence of iron and therefore lower carbon content. Non-ferrous is not corrosion-proof but is generally more corrosion-resistant than ferrous metals. The formulations of VCI materials can vary depending on the type of metal they are intended to protect. Using the wrong VCI bag or paper, particularly when dealing with ferrous or multi-metal compounds can have disastrous effects. Some VCI formulations that protect ferrous metals from corrosion will actually attack non-ferrous metals. The only thing worse than not properly protecting metalwork is thinking it is properly protected when it isn’t. Even if VCI paper is used when packaging a product, it’s important that those in the packing area inspect the piece to ensure that the treated side of the paper is facing towards the metal. Producers lose thousands of dollars a year thanks to improper packaging. Green Packaging Inc. treats both sides of VCI paper to ensure that, regardless of which side a piece is packaged on, metal parts are fully protected. Green Packaging, Inc. can also design the most appropriate corrosion prevention system for each company’s specific needs. Join us next month when we’ll be conclude our 13 part blog series on our essential processes with the final installment. In the meantime, head over to https://green-vci.com/ to peruse our inventory and buy rust protection for your metal pieces.